High-grade robust hose connector. The hose is fixated safely by the union nut and seals immediately, yet it can easily be released with one hand. The connector is angled by 90°. This system ensures maximum safety and easy of use. 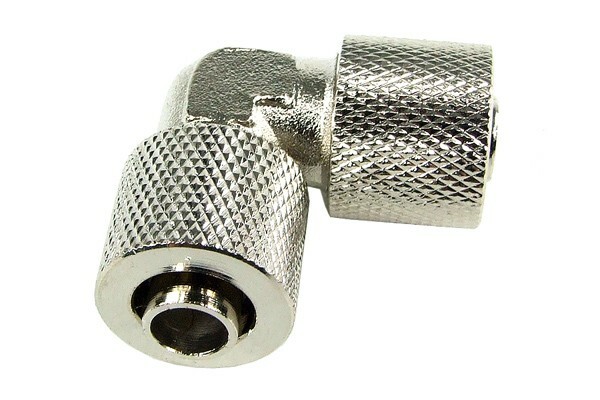 The connector is compatible with hoses with an outer diameter of 10mm and an inner diameter of 8mm. This fitting is functionally equal with current fittings and only the optical design of the fitting and union nut vary. This type of fitting was most commonly sold until 2006 and was afterwards replaced by the new version. To allow customers with systems in the old fitting design to expand or replace their system we still offer these fittings. As they are more expensive in manufacturing and trade we generally recommend new customers to use the new fitting type.